Stocks showed no spine on Monday as key benchmarks Sensex and Nifty struggled to shake off worries arising out of a spreading global growth slowdown and bruising China-US tariff dispute. The government on Tuesday will launch an offer for sale to divest Axis Bank stake, it holds through the Specified Undertaking of Unit Trust of India (SUUTI) . The Axis Bank’s SUUTI block is valued at about Rs 5,316 crore. The government plans to sell 1.98 per cent stake in the company as base offer, with an additional 1.02 per cent set aside as greenshoe option. Industry-wide slowdown hurt sales at VE Commercial Vehicles (VECV), Eicher’s joint-venture with AB Volvo. Heavy Duty (HD) segment was hit the most. VECV sold 16,936 trucks and buses in the quarter, up 4 per cent YoY. VECV’s Ebitda dropped 18 per cent to Rs 186 crore from Rs 226 crore in the same period last year while profit after tax plunged 43 per cent to Rs 76 crore from Rs 133 crore last year. Revenue from operations rose 9 per cent to Rs 2,818 crore in December quarter from Rs 2,590 crore in the same period last year. Japan’s shut, most other Asian equity markets aren’t doing much, and you can read about the big exception -- China -- here. So we’re going to use this opportunity to talk about India, where an unpredictable election looms. Even before the ballot takes place, a host of worries is raising questions about whether the country’s benchmark stock index can repeat last year’s outperformance. Gain in heavyweight mining and banking stocks helped European shares recover from one-week lows on Monday as investors turned their focus to the start of a new round of trade talks between Beijing and Washington. The STOXX 600 index was up 0.7 percent by 0828 GMT, helped by a broad-based bounce, while Germany's trade-sensitive DAX was up 0.6 percent and the UK's FTSE added 0.7 percent. China struck an upbeat note as trade talks resumed with the United States, but also expressed anger at a U.S. Navy mission through the disputed South China Sea, casting a shadow over the prospect for improved ties between them. The MCX Gold was trading at Rs 33,155 per 10 grams, down by Rs 87, while MCX Silver was trading Rs 85 lower at Rs 40,020 a kilo around 11:15 am. The sentiment was dragged by lower demand at the spot market. Shares of Indiabulls Housing Finance plunged nearly 6 per cent to hit its 52-week low of Rs 578.60 on BSE in Monday's session. With this, the stock extended its losing streak to the third consecutive session. In a BSE filing on Friday, the company said Japanese SoftBank has invested Rs 2,800 crore in the UK-based OakNorth Bank, in which Indiabulls Housing Finance has a controlling stake. NEW DELHI: Eicher Motors is all set to report its third quarter results on Monday. Investors will keenly follow the commentary on Royal Enfield’s inventory level and its demand in metros, tier 1 and tier 2 cities. 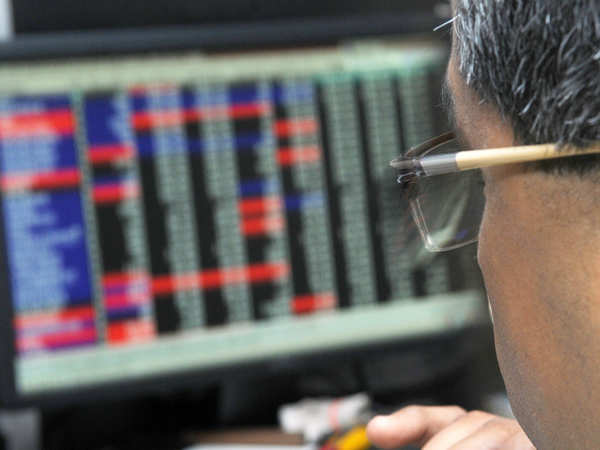 At 10.30 am, the scrip was trading 0.46 per cent higher at Rs 20,943.35. During the quarter gone by, Royal Enfield’s volumes rose 3.8 per cent YoY to 214,451 units. Motilal Oswal Securities expects the company to report 8.3 per cent YoY rise in adjusted PAT at Rs 580 crore. Shares of Tata Motors tanked over 3 per cent in Monday’s trade, tracking a sharp fall in American depository receipts (ADRs) on Friday. The stock fell 3.63 per cent to hit a low of Rs 148.80 on BSE. Data showed Tata Motors saw 8 per cent fall in its ADR price ($10.5) at close on Nasdaq Friday. The ADR trades post Indian markets’ closure. Shares of Tata Steel climbed 2 per cent in Monday's session after the company on Friday reported 54.31 per cent year-on-year (YoY) rise in profit at Rs 1,753 crore for December quarter. Tata Steel’s December quarter earnings failed to surprise analysts. However, the short-term outlook is favourable given a sharp rise in iron ore prices, extension on import duties by Europe and a jump in domestic steel prices, as per an ET report. Hong Kong-based broker CLSA, in a note titled “Pigs That Might Fly,” lists 22 stocks in Asia region where valuations are at record low levels due to perception concerns, but offers significant upside if valuation reverts to the mean. Of the 22 stocks, six are from the Indian market including ONGC, Coal India, Bharti Airtel, ACC, ICICI Pru and ZEE Entertainment. On a consolidated basis, EBitda of Vedanta Resources was $1.6 billion in the first half of FY19, mostly contributed by Vedanta in India. The consolidated net debt was $10.2 billion in the six months to September 2018. The annualised consolidated EBITDA works out to be $3.2 billion. This implies a debt-EBITDA ratio of 3.2, which is almost twice that of the India-listed Vedanta. Benchmark indices opened on a weak note on Monday, tracking tepid cues from other Asian markets. Weak technical charts added to the weakness. At 9.23 am, the BSE Sensex was trading 119.28 points, or 0.33 per cent, low ear 36427.20. Nifty50 fell 56 points or 0.51 per cent, to trade at 10,887.30. Among Sensex stocks, M&M declined 2.83 per cent to Rs 663.70. It as followed by Hero MotoCorp, ONGC and Tata Motors, which fell 2.11 per cent, 2.06 per cent and 1.65 per cent, respectively. Sensex, Nifty edge lower; rupee trades at 71.26 against dollar. Nifty futures on the Singapore Exchange were trading 30 points, or 0.27 per cent, lower at 10,916.50, indicating a negative start for the Nifty50. The Nifty50 tanked over 100 points on Friday to settle below the 10,950 mark. Traders did not respect the breakout support at 10,985, as the index formed an ‘Evening Doji Star' on the daily chart. The candle signalled downside momentum ahead. Crude prices fell by around 1 per cent on Monday as US drilling activity picked up and as Russia’s biggest oil producer pressured President Vladimir Putin to end the supply cut deal with Middle East-dominated producer club OPEC, Reuters reported. International Brent crude oil futures were down 53 cents, or 0.9 per cent, at $61.57 a barrel. Asian shares started the week on the backfoot on Monday as worries about global growth, US politics and the ongoing Sino-US tariff war kept investors cautious, while the safe-haven greenback held near a six-week top against major currencies, Reuters reported. MSCI’s broadest index of Asia-Pacific shares outside Japan was a tad weaker after it was toppled from a four-month top on Friday. Wall Street's main equity indexes recouped losses late on Friday, with the benchmark S&P 500 index ending marginally positive and the Nasdaq Composite index adding 0.14 per cent. The Dow Jones Industrial Average index fell 0.25 per cent, Reuters reported. Tata Motors, which is at a crucial support level, could witness a further round of selling on Monday, going by the almost 8 per cent fall in its ADR price ($10.5) at close on Nasdaq Friday. The ADR trades post Indian markets’ closure. The stock on Friday closed down 17.88 per cent at Rs 150.15 on NSE. Eicher Motors, SpiceJet, India Cements, Motherson Sumi, Hindustan Copper, Max India, Jaypee Infratech, Andhra Bank, Care Ratings, Amtek Auto are among 313 companies set to announce their December quarter results on Monday. Anil Agarwal, the owner of some of the largest mining assets in India, is known for a high appetite for risky bets. Over the past two decades, some of the large-ticket acquisitions helped him build an empire in the mining and metals business but not without a mounting pile of debt. Given the focus on the indebtedness of Indian companies and their promoters, the debt at the holding company level in the Vedanta group may come under scrutiny. Deutsche Bank has made its single-largest equity infusion in India, placing bets on digital technologies to expand its retail operations and double revenue from that business in the country. The Frankfurt-headquartered lender has put €500 million (about Rs 4,000 crore) in December, its second infusion within a year, taking its total capital to €1.9 billion, Werner Steinmueller, Asia Pacific CEO, said in an interview. Foreign portfolio investors (FPIs) bought Rs 844 crore worth of domestic stocks on Friday, data available with NSE suggested. DIIs were net buyers to the tune of Rs 960 crore, data suggested. For the week, the BSE Sensex rose 77.05 points, or 0.21 per cent, to 36,546.48. Nifty50 gained 49.95 points, or 0.45 per cent, to settle the week at 10,943.60. Here are a few stocks which were in limelight all through the week.